Mommy This &That: Taking a little stroll. We didn't have any intentions of even visiting this store, but some how Hubby pulled into a spot closer to them then the store I had intended on visiting, Michael's. We walked in the direction but then I headed towards Michael's and Hubby commented on how he knew I said Michael's but for some reason thought Marshall's...the said store that we had no intentions on visiting. After looking through Michael's and not finding what I really wanted we headed out and I decided Marshall's why not? They don't have maternity clothing and not knowing the gender of our baby means there isn't the chance of buying baby stuff. And I am trying to be good about my shoe purchases, so no problen right? Guess who walked out with a brand new stroller for baby? Yep, we did. It was brand new, in the box for way less than we've seen on ebay or at places like Babies R'Us. So what that it's last year's model...it's the brand I want at a price that could not be beat! I think the stroller was calling to Hubby as we pulled into the plaza, especially since I can't remember the last time I went to Marshall's. Woot-woot for one less item on the baby registry. Score! I love it when that happens! Looks like a great stroller!! SO is that the VERY first BABY purchase you have made? DO tell! We loved baby shopping! It was the best time for me and the HUBS! IT was so so much FUN! 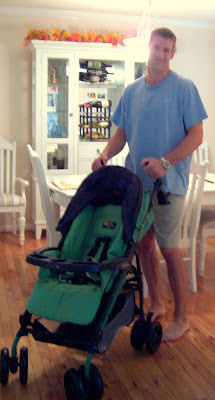 Congrats on the Stroller! HEY I left you something on my blog! Marshall's and TJ Maxx are my absolute faves! You ran into some good Shopping Luck, didn't you? Got Banana Split Cake going on at my place today--please drop by!